The town of Ringwood was a glove-manufacturing hot spot in Victorian England, and this easy textured stitch was a traditional pattern that knitters used for their wares. 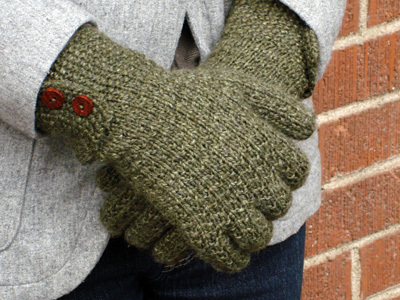 In his book A History of Hand Knitting, Richard Rutt reproduced an old pattern for the traditional gloves. I have updated it here with a range of adult sizes, and a smart buttoned seed stitch cuff inspired by the tidy tabbed wrist closures of equestrian gloves. 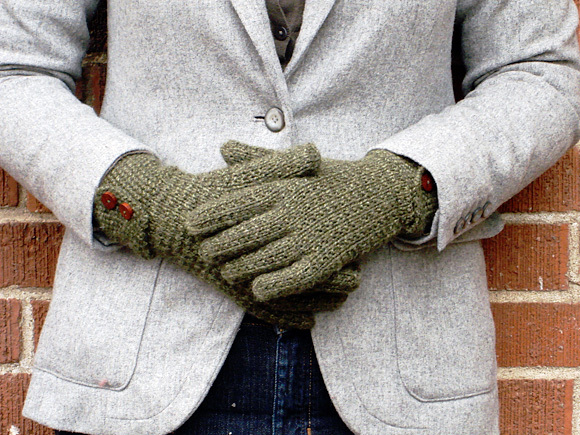 The Ringwood Stitch is stretchy and cozy by itself, and pure merino wool yarn makes the gloves thick and soft. They are thoroughly practical and perfect for ushering in winter. Finger/hand length adjustable to fit. 4 buttons Note: Buy buttons after gloves are complete to ensure correct size. The Ringwood stitch pattern is very stretchy. If in doubt, err on the side of making gloves that are too small around -- they will stretch to fit. Seed Stitch: Worked back and forth over an odd number of stitches. All rows: [K1, p1] to end. Ringwood Stitch: Worked in the round over a multiple of 2 sts. Round 1: Knit. Round 2: [K1, p1] to end. CO 51[55, 61] sts. Do not join. Work Seed Stitch for 7 [7, 9] rows. Buttonhole row: K1, p1, k2tog, yo, [k1, p1] to end. Next row [RS]: BO 11 sts, k to end. 40[44, 50] sts remain. Divide sts across your needles as you prefer and join for working in the round, being careful not to twist. Note or mark the beginning of the round. From here you will work in Ringwood Stitch. Work Rounds 1-3 of pattern 3[3, 4] times. Sizes S & M only: Work in established pattern for 20[22, -] sts, PM, m1, k1, m1, PM, work in established pattern to end of round. Size L only: Work in established pattern for -[-, 25] sts, PM, m1, p1, m1, PM, work in established pattern to end of round. Increase round: Work to first marker in established pattern, sl marker, m1, work to second marker in pattern, m1, sl marker, work to end in established pattern. Work 2 rounds even, incorporating new sts into pattern. Repeat the previous 3 rounds 5[6,7] more times until there are 15[17, 19] sts between markers. Work in Ringwood Stitch as established for 12[15, 18] more rounds, or until hand of glove is long enough to cover knuckles. Work first 4[5, 6] sts of round in Ringwood Stitch. Sl next 32[34, 38] sts of round onto scrap yarn. CO 2 sts over the gap, and work remaining 4[5, 6] sts of round in pattern. 10[12, 14] sts total. Divide sts across your needles and mark the beginning of the round. 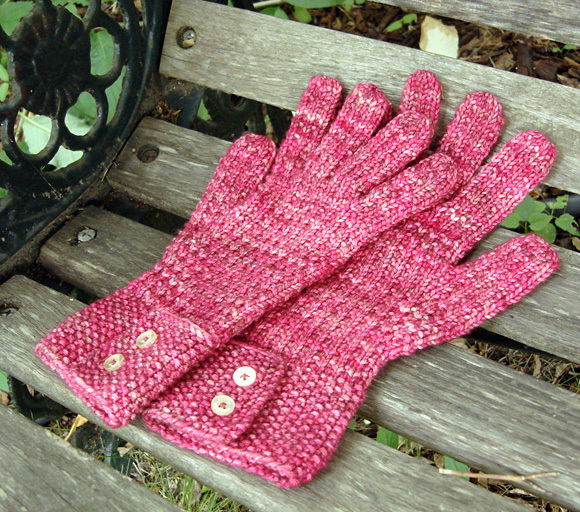 Work in Ringwood Stitch for 2[2.5, 2.75] inches or until the finger is desired finished length. Decrease round: K2tog around. 5[6, 7] sts. Break yarn and thread it through the remaining sts. Fasten off. Return the 4[5, 6] sts closest to the pinky finger on each side to your needles. With RS facing, working away from the pinky finger, join yarn and work in pattern across 4[5, 6] sts, CO 2 sts over the gap, work across the next 4[5, 6] sts, and pick up and knit 2 sts over the CO edge of the previous finger worked. 12[14, 16] sts. Divide sts across your needles and mark the beginning of the round. Work in Ringwood Stitch for 2.5[3, 3.5] inches or until the finger is the desired finished length. Decrease round: K2tog around. 6[7, 8] sts. Return the 6[6, 6] sts closest to the pinky finger on each side to your needles. With RS facing, working away from the ring finger, join yarn and work across 6[6, 6] sts, CO 2 sts over the gap, work across next 6[6, 6]sts, and pick up and knit 2 sts over the CO edge of the previous finger worked. 16[16, 16] sts. Divide sts across your needles and mark the beginning of the round. 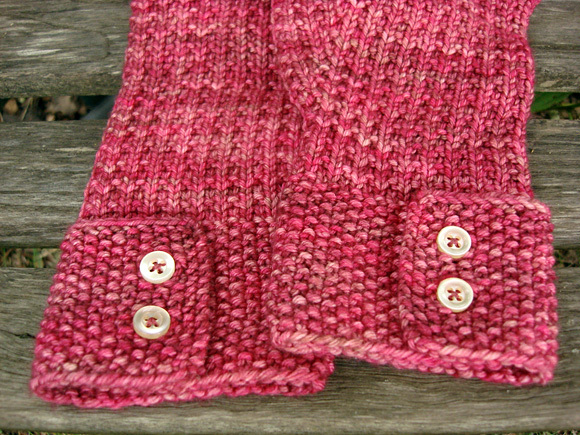 Work in Ringwood Stitch for 3[3.5, 4] inches or until finger is desired finished length. Decrease round: K2tog around. 8[8,8] sts. Repeat Decrease round. 4[4, 4] sts. Place the remaining 12[12, 14] hand sts on your needles. Working away from the middle finger, rejoin yarn and work across sts, then pick up and k 2 sts over the CO edge of the previous finger worked. 14[14, 16] sts. Divide sts across your needles and mark the beginning of the round. Decrease round: K2tog around. 7[7, 8] sts. Decrease round 2: K2tog 3[3, 4] times, k1[1, 0]. 4[4, 4] sts. Return 15[17, 19] held thumb sts to your needles. Join yarn and work in pattern across sts, then pick up and k 3 sts over the open edge of the hand. Divide sts across your needles and mark the beginning of the round. Next round: Work 15[17, 17] sts in pattern, sk2p. 16[18, 18] sts remain. Work even in Ringwood Stitch until thumb measures 2[2.5, 3] inches, or desired finished length. Decrease round: K2tog around. 8[8, 9] sts. Buttonhole row: Work seed st to last 5 sts, k2tog, yo, k1, p1, k1. Work Seed Stitch for 6 [6, 8] rows. Next row [WS]: BO 11 sts, p to end. 40[44, 50] sts remain. Work remainder of right glove the same as for left glove. Weave in all ends, using the ends at the base of each finger to mend any holes in this area if necessary. Block gloves by washing in lukewarm water, squeezing out excess water in a towel, and laying flat to dry. When gloves are completely dry, cut off loose ends. Fold over cuff flaps and mark button locations by putting a pin through each buttonhole and into the cuff fabric beneath. Using matching thread, sew on buttons. 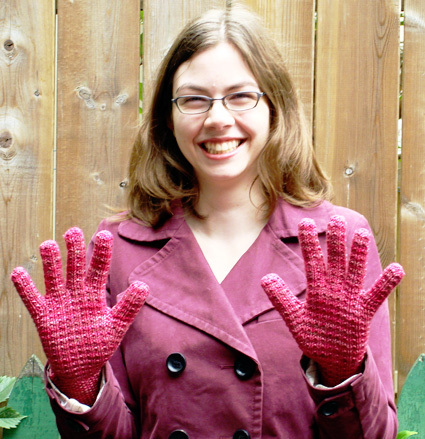 Rebecca lives and knits in Canada, where her favourite things to make are lace and warm winter accessories.